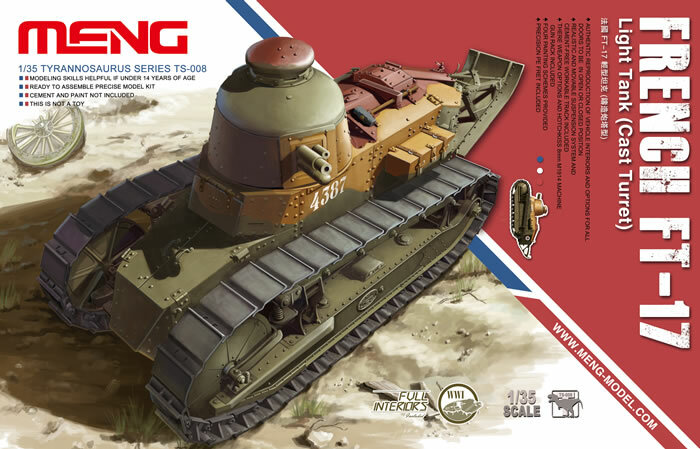 Meng Models' :35 scale FT-17 Light Tank (Cast Turret) is coming! In 1917, FT-17 light tanks roared across the horizon and achieved a great success. The concept of this tank was originated by Jean-Baptiste Eugène Estienne who’s considered to be “Father of the Tank” in France. It was designed by the talented designer Rodolphe Ernst Metzmaier and manufactured by a French company, Renault. The FT-17 light tank is considered to be the earliest modern tank on the basis of its outstanding performance and design concept showing great foresight. In order to commemorate this tank of great historic significance, the MENG team represent this FT-17 tank perfectly in 1:35 scale by taking all measurements of a real FT-17 tank with the help of our German adviser and by studying a lot of historical documents and reference material. This FT-17 light tank (cast turret) kit, numbered TS-008, consists of 10 plastic sprues totalling 404 parts, 1 PE fret totalling 9 parts and 6 metal parts including springs. Decals for four marking schemes are provided for tanks during WWI, WWII and the Winter War between the Soviet Union and Finland, representing the llong service of FT-17 tanks. Kit No. TS-008 not only reproduces the exterior details of FT-17 tank, but also represent its internal equipment and structure to the maximum degree. All hatches may be built in open or closed positions. When the hatches are open, the complete power system, driver’s cabin and turret interiors will be presented, offering a detailed view of this precision machine. This kit has a compact look by combining a full interior with small size of the tank. Its movable suspension system reproduces the real structure. Cement-free workable track links are provided. Three weapons equipped as main weapon of FT-17 tank as well as a rack for Hotchkiss 8mm M1914 machine gun are provided for modeler’s choice. This compact TS-008 kit will bring you a very enjoyable modeling process!